If you have any questions or want to enquire about dates, use our form to contact Pippa Lockhart. Wide cobbled streets, manicured communal gardens, vast sash windows affording glimpses into houses one can only dream of living in: welcome to New Town. You enter this lower ground-floor flat down gently curving steps, and open the door to an interior of elegant sophistication; the flagstoned floor, gilt mirror and fresh flowers are just the start. Down the corridor to the sitting room, a soothing space, with original fireplace, fine Victorian and Edwardian furniture, brand-new entertainment system and paintings and prints. The small kitchen to the side is decked in glass, stainless steel and every modern thing; the bathroom is a spectacle of floor-to-ceiling marble, with a drenching shower and a sumptuous mini bath. In the bedroom, one of Pippa’s vintage travel cases folds out to reveal a set of drawers and a hanging rail, while stretches of pale stripped floorboards and a window onto the garden create a light and easy feel. The owners, who live on the top floor, have thought of everything, from children’s games to milk in the fridge. Impeccable. Absolutely stunning flat in fantastic central location. We stayed for the Hogmanay celebrations and were made to feel immediately at home by kind and generous hosts. Lovely homely touches enhanced our stay : beautiful furniture, decor and objects in the flat plus excellent bookcase with boardgames also! Short walk to all amenities but lovely quiet surroundings for a few days in the capital city of Scotland. Would definitely visit again. We had a perfect week end at 10 London Street. 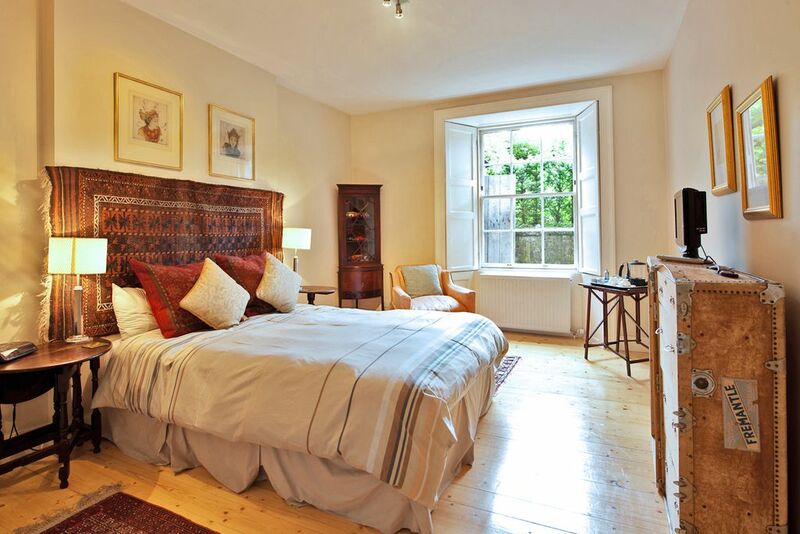 The flat is very conveniently located very comfortable and the owners extremely nice and helpful. I will definitely stay there again on my next visit. Quiet, lovely and spotless flat - in a great location. Would certainly return! Wonderful apartment in a great location in New Town--spacious, quiet, well-decorated, fully-equipped kitchen, comfortable queen-size bed with sofa bed if needed. Helpful owner who lives in same building. Small grocery across the street and lots of restaurants on street around the corner. Within walking distance to every place we wanted to see in Edinburgh, from Old Town's Royal Mile, to Stockbridge & Dean Village, Leith and the HMY Royal Britannia, Botanic Gardens and Water of Leith pathway. We would definitely stay again. Lots of great restaurants, galleries, quirky shops and pubs in the vicinity. Great little corner shop if you want to buy ingredients and cook for yourself! Situated in the heart of the World Heritage Area - you get the best of Edinburgh in a nutshell! Experience the excitement of the city and return to a beautiful peaceful haven to put your feet up and relax.